Some users are having issues exporting pictures. If you are one of them, please, manually change the file extension according to the selected format and export will work. Please, if you experience some problem with the app contact us by email and we will help you as soon as possible. 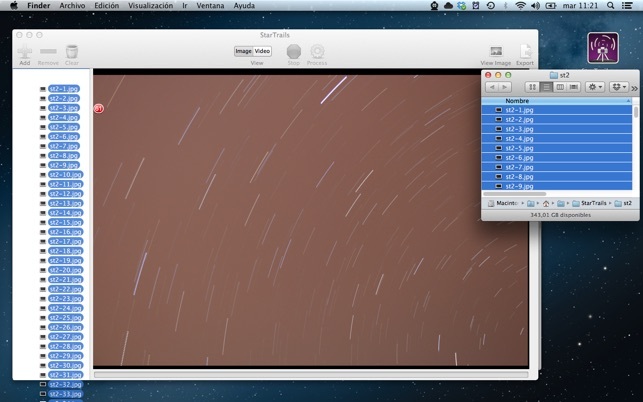 An application to generate easy and quick impressive Star Trails pictures and videos. Import your shots, process, visualize the progress and export. 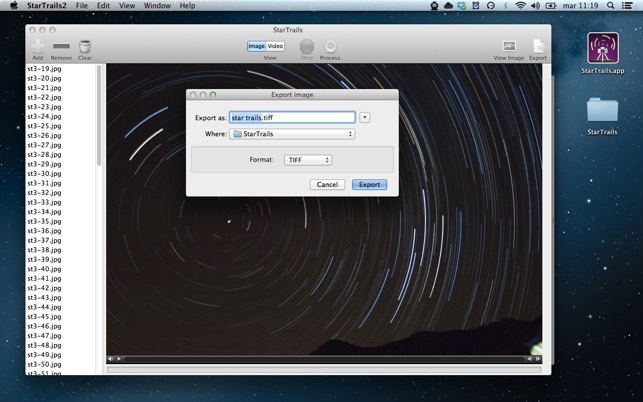 Stack your pictures without going through photoshop. 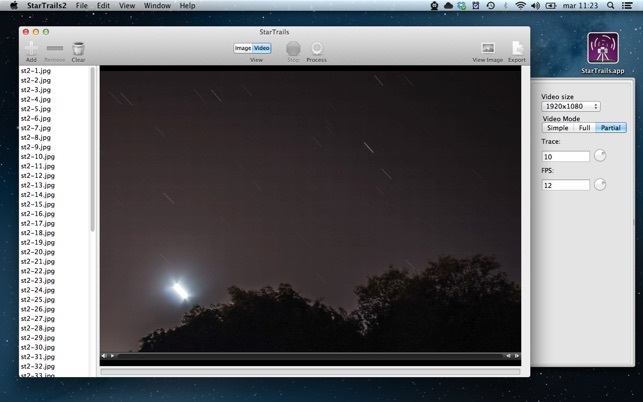 You can see Star Trails in action on the web and download sample packages. The app is awesome in it’s simplicity and operation. I do not like people leaving support requests in reviews but the developer has left no other option. The support link goes to a product web page and from there no option exists to ask for help or report a problem. The link to the forum is bad as well. The big issue is exporting. PNG format works but selecting “JPG" does not change the file name suffix (i.e. .JPG) nor does it actually export anything when you click the “Export” Button. If his problem is corrected te app would be great. Soon after installing app I loaded a series of images to stack, unfortunately this app does not fill star gaps which is common with star trail photography. The interface is very easy to use, simply load your images and click on “process”. Export however does not work neither in tiff or jpg format despite the fact that I loaded the latest version which claims to “fix the exporting problems”. Before installing app I read the reviews which praised this app but unfortunately I could not say the same, overall I would say that this has been a terrible experience and not worth the $5.99 for which i paid. BUYER BEWARE! Not worth it since it does not export! Developers need to resolve the export issue and allow for star gap filling. 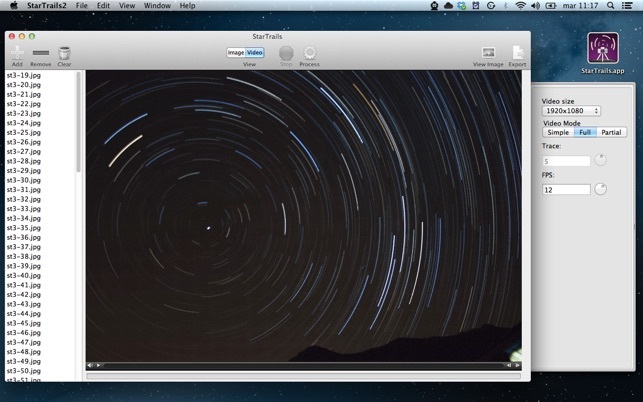 Star Trails is a very convenient and simple way to stack images that render them as either a single image or a short video to see the stars movement! 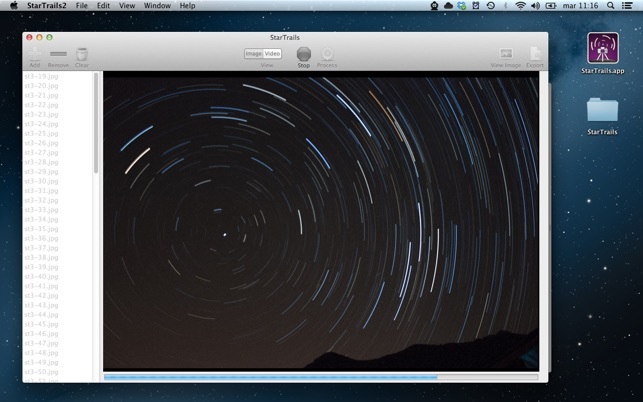 This is the only app out there that works well with Mac. Easily worth $5.99. The format and layout is very simple and elegant, quite easy to use with a great outcome. There was an exporting problem but it’s fixed now! The customer service is hands down the best i’ve ever recieved from an app developer. Prompt and personal responses to help you with whatever your problem may be. HIGHLY RECOMMENDED! WHOOP WHOOP!!! !